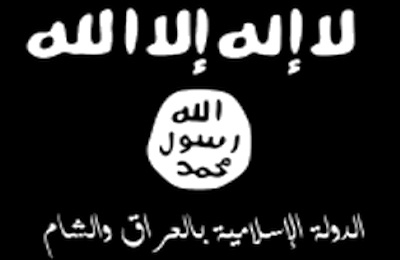 The ISIL/ISIS flag with "The Islamic State of Iraq and Sham" written under the shahada. Some conservatives make an issue of the fact that President Barack Obama routinely refers to the organization that seized the Iraqi city of Mosul and declared a caliphate not as the "Islamic State in Iraq and Syria," or ISIS, but as the "Islamic State of Iraq and the Levant," or ISIL. In his televised address about the group on Sept. 10, for example, he used the acronym ISIL twenty times. In other words, Levant inflates the group's ambitions from merely two countries to significantly more. Some go even further; Phyllis Chesler tentatively adds Saudi Arabia and the Persian Gulf emirates. 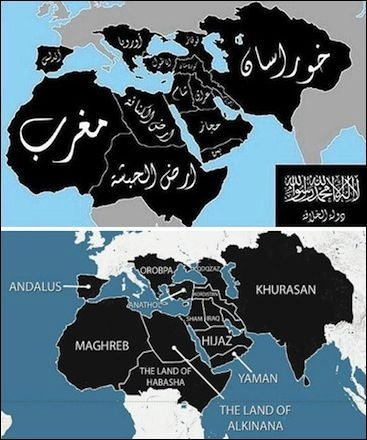 When Barack Obama refers over and over to the Islamic State as ISIL, he is sending a message to Muslims all over the Middle East that he personally does not recognize Israel as a sovereign nation, but as territory belonging to the Islamic State. But there is no meaningful geographic or political difference between the two translations. In Arabic, the organization (at least until it was renamed in late June 2014) is Ad-Dawla as-Islamiya fi'l-Iraq wa'sh-Sham (‏‎الدولة الإسلامية في العراق والشام‎, known in Arabic by the acronym Da'sh). All but the final word are simple to translate; Sham, usually translated as Greater Syria, has no exact equivalent in English. Greater Syria is a amorphous geographic and cultural term like Middle West or Middle East that lacks official boundaries: it always includes the modern states of Syria, Lebanon, Israel, and Jordan, as well as the Palestinians territories, but some also consider it to include parts of Egypt, Iraq, Turkey, and even all of Cyprus. Because "Greater Syria" is heavy on the tongue, Da'sh's name gets simplified to "Syria." But that name being so easily confused with the existing state of Syria which first came into existence in 1946, others choose to translate "Sham" as "Levant." Although Levant has the distinct advantage of not being thus confused, it is an archaic word dating to the fifteenth century full of gentle and exotic connotations utterly inappropriate to the murderous Da'sh. Its borders are also imprecise, referring vaguely to the countries of the eastern Mediterranean, where the sun rises (levant is French for "rising"). In short, both translations are accurate, both are correct, both define a similar area, and both have deficiencies – one refers to a state, the other has an archaic ring. For reasons unknown to me, the executive branch of the U.S. government adopted the ISIL nomenclature and its staff generally use this term, even though members of Congress, the media, and specialists (including me) generally prefer ISIS. So, let's not worry how to translate Da'sh and concentrate our efforts instead on ridding the world of this barbaric menace.